As New Yorkers mark the beginning of trout fishing season, the New York City Department of Environmental Protection (DEP) encourages anglers to cast a line at its reservoirs or at dozens of properties that include frontage along streams, rivers and lakes throughout the Catskill Mountains and Hudson River Valley. New York City’s water supply features some of the best trout fishing in the Northeast. Its 22 reservoir and lakes, covering roughly 36,000 acres, are open for fishing from shore or approved boats. Most of the reservoirs include deep water that is ideal for coldwater species such as trout, and habitat suitable for bass and other warmwater species. The New York State Department of Environmental Conservation outlines statewide fishing regulations, including information on licenses, catch limits, and stocking, on its website. Those fishing on the City’s reservoirs must also have a free DEP Access Permit. Find your species of choice. The reservoir system is home to many species of fish that are coveted by anglers, but some reservoirs include better habitat for one species or another. DEP has compiled a handy fishing brochure (PDF) for anglers to know which species are located at each reservoir, and whether the fishing for each is fair, good or excellent. Find the deepest, coldest water. Some of the best trout fishing on New York City’s reservoirs happens where the water is coldest and deepest. Other species are best found in the shallows. DEP provides angler maps that show the depth contours in each of our reservoirs. Rent a boat for access to deeper water. 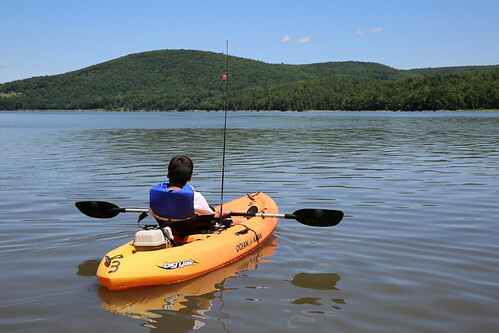 Four of New York City’s reservoirs in the Catskills—Cannonsville, Pepacton, Neversink and Schoharie—allow the use of kayaks and canoes starting each year on Memorial Day weekend. Local businesses also rent pre-cleaned boats at each of these reservoirs, making it easy for anyone to access the reservoirs. Rental boats are also a great option for anglers, who might not own a boat, to access some of the deeper water at these reservoirs. Learn more information about the Recreational Boating Program. Fishing abounds on streams, rivers and lakes. Great fishing can be found beyond the reservoirs. New York City owns more than 200 miles of frontage along streams, creeks and rivers throughout the watershed. Many of these spots are excellent for fishing off the beaten path. Some water supply lands also include lakes or ponds that are suitable for fishing. DEP has created an interactive map—known as the RecMapper—to help outdoor enthusiasts find these points of access throughout the watershed. Anglers can use the digital map to zoom in to each property, find waterbodies, and print driving directions. The RecMapper can be found at nyc.gov/dep/recmap. Look toward the tailwaters. Some of the best fishing is found just beyond the dams that form New York City’s reservoirs. DEP releases water from almost all its reservoirs on an ongoing basis. This water that’s released downstream of our dams&mdsah;commonly referred to as “tailwaters”—creates conditions for excellent fishing. The tailwaters usually include public access points, many of which are operated and maintained by the state. Fishing on all city-owned reservoirs and lakes, along with some recreation units along streams and creeks, requires a free DEP Access Permit. An access permit can be obtained through DEP’s online permitting system, found at nyc.gov/dep/accesspermit. Those who want to use rowboats on the reservoirs must also register their boat with DEP, have it steam cleaned, and affix a valid boat tag to the side of the boat. Those with questions about permitting and boat tags may email recreation@dep.nyc.gov or call (800) 575-LAND. Those fishing on streams that run across water supply lands should carefully check signs in those recreation units to determine whether a permit is required. The breadth of fishing opportunities on City reservoirs and land underscores DEP’s effort to support the recreation and tourism economies in the watershed by opening more properties to recreation. There are currently more than 130,000 acres of City property open for recreation in the watersheds, including the reservoirs. DEP manages New York City’s water supply, providing more than 1 billion gallons of high-quality water each day to more than 9.5 million New Yorkers. This includes more than 70 upstate communities and institutions in Ulster, Orange, Putnam and Westchester counties who consume an average of 110 million total gallons of drinking water daily from New York City’s water supply system. This water comes from the Catskill, Delaware, and Croton watersheds that extend more than 125 miles from the City, and the system comprises 19 reservoirs, three controlled lakes, and numerous tunnels and aqueducts. DEP has nearly 6,000 employees, including almost 1,000 scientists, engineers, surveyors, watershed maintainers and other professionals in the watershed. In addition to its $70 million payroll and $166 million in annual taxes paid in upstate counties, DEP has invested more than $1.7 billion in watershed protection programs—including partnership organizations such as the Catskill Watershed Corporation and the Watershed Agricultural Council—that support sustainable farming practices, environmentally sensitive economic development, and local economic opportunity. In addition, DEP has a robust capital program with $18.9 billion in investments planned over the next decade that will create up to 3,000 construction-related jobs per year. For more information, visit nyc.gov/dep, like us on Facebook, or follow us on Twitter.